Hokkaido has a rather short summer in comparison to the mainland Japan. This is when the mountains and valleys come alive with colourful flowers after being buried under snow for almost 6 months. Hokkadians too come out of their winter cocoon and go out to experience nature’s beauty. 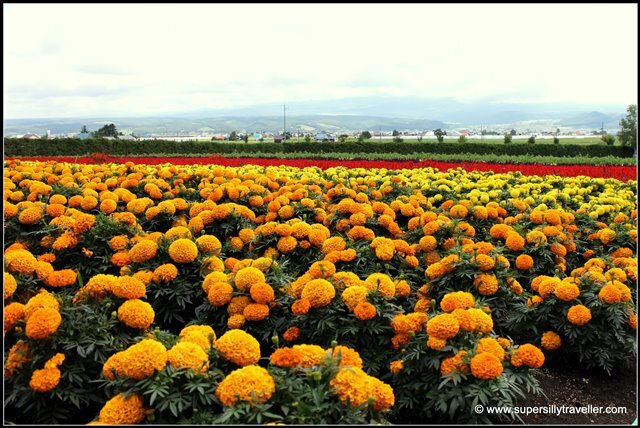 Furano and Biei in central Hokkaido are two popular destinations among the locals and tourists in summer. The region is full of beautiful flower fields, impressive landscapes and humble terrains. On one such hot weekend in July, we too went on a day trip to Furano and Biei. Furano is called the belly button of Hokkaido as it is located right in the middle of the island. The belly button festival celebrates this unusual association of the biology with geography. 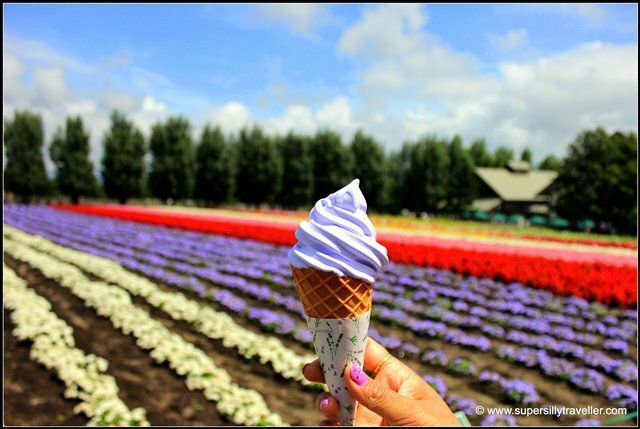 Furano is popular for its flower valleys in summer and the skiing resorts in winter. It is the destination for viewing numerous varieties of flowers including Salvias (best known for attracting humming birds), Lilies and Poppies. In the flower kingdom of Hokkaido, Lavender is the king of all. It has been cultivated here for more than 50 years. 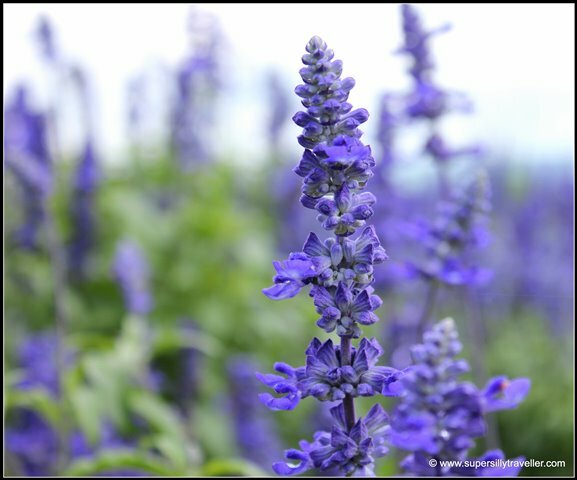 Four varieties of this aromatic flower start blooming in Furano from late June to early August. 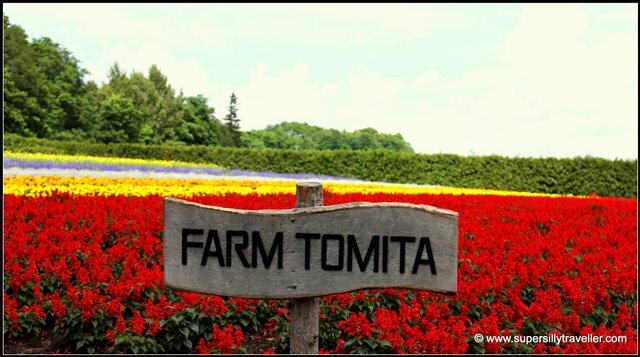 Bustling with tourists from June to September, Farm Tomita is an excellent spot for viewing acres of Lavender field along with beautifully arranged rows of other flowers such as Marigold, Sunflower and Sage. Volcanic Mountain Tokachi acts as an excellent backdrop for some good pictures. At Farm Tomita East, a full blown Lavender field, you can hop onto a bus and get a ride across the field for 200 JPY. Entry to the both the farms are free and there are many shops filled with a range of lavender products. Occasionally, I suffer from a compulsive buying disorder 😳 and it was one of those days when I went on a lavender spree .
. Tomita Melon House, just outside the Tomita farm is a good place for lunch and enjoying a variety of Hokkaido melon inspired desserts. How to reach the farm Tomita? 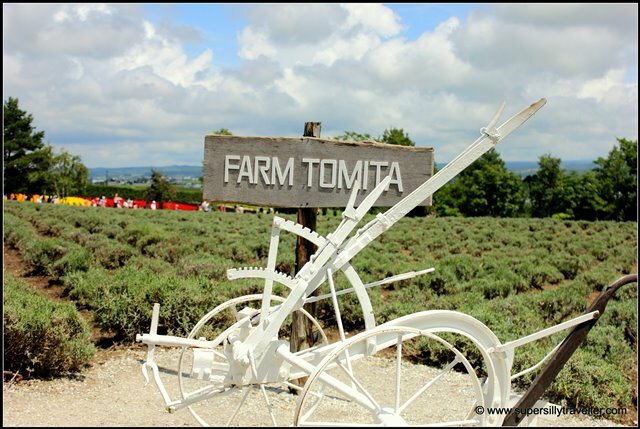 Click here for directions to farm Tomita. Outside the flower season, access by public transportation to this farm is pretty much non-existent. Farm Tomita Lavender is about 4 kilometres east of Farm Tomita and inaccessible by public transport. From July 4 to August 16, the B-route of the Furano Kururu Bus connecting Furano Station with Farm Tomita runs three times per day. The ride takes about 25 minutes and costs 1200 yen for two calendar days of unlimited use.
. The farm is open from 9:00 – 6:00 pm during the Lavender viewing season i.e. June to August. How to reach Flowerland Kamifurano? A large Lavender garden with a view of Mt. Tokachidake and Mt. Ashibetsudake. Here too you can get hands on experience in lavender picking with the local farmers. Open from 8 am to 5 pm June – September. How to reach Farm Sasaki? About 15 minutes on foot from JR Naka-furano station (about 10 minutes from Furano on the Furanosen line and 230 JPY). Click here for directions. Tip : Mid July is the best time to visit as the farms start harvesting the flowers in late July. The belly button festival is held every year on July 28th and 29th in Furano. A cheese factory where you can watch and learn to make cheese by yourself. Taste cheese samples with squid ink and wine. Reach early to watch the process of cheese making as the work winds down in late afternoon to close for the day. How to reach Furano Cheese Factory? Furano cheese factory is approximately 3.5 km from Furano JR station. The Furano Kururu sightseeing bus also stops here. Click here for directions to the factory. How to reach Furano Wine Factory? It is about 7 km from Naka-furano station. Click here for directions. It is also one of the stops for the sightseeing bus. It is a group of ryokans at the slopes of volcanic Mt. Tokachidake with onsens at 1300 meters above sea-level. Yumoto Ryounkaku also known as the onsen in the sky is probably the highest in Hokkaido. Entry fee for non-residents is 800 JPY. How to reach Tokachidake Onsen? 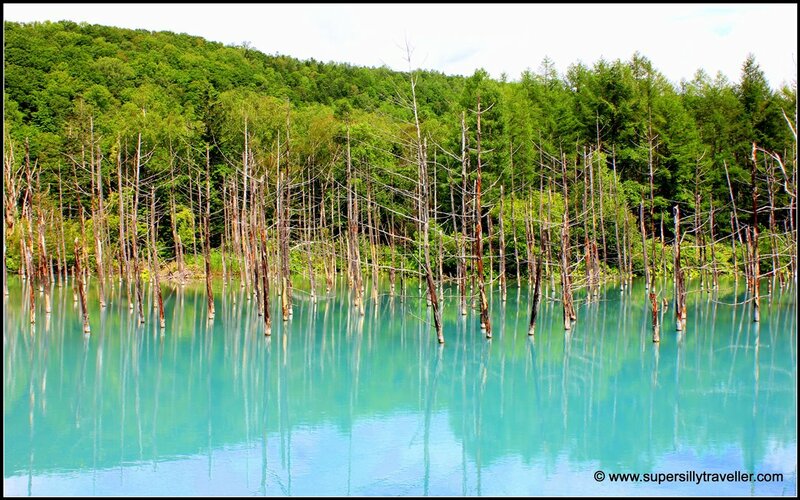 Tokachidake is about 30 minutes drive from the Kamifurano station. Limited bus service is also available from the station to the onsen and costs 500 JPY. Click here for directions. After spending time in the belly button town, we went to Biei (美瑛) a small town about 30 minutes’ drive from Furano. One of the best ways to travel between Furano and Biei is driving through the garden hopping Route 237 also known as the Flower drive. A number of farms with flower fields lie on this route. Biei is surrounded with picturesque landscape of hills and vast fields with a scenic view of the Daisetsuzan mountain range. A good way to travel around here is by car or a bike. There are many stores in Biei such as Guide no Yamaga (ガイドの山小屋) in front of JR Biei station where you can rent a bike. A pond with dazzling blue colour that is one of the official wall papers of Apple devices such as iPhones and MacBook. It was created during the construction of a dam to protect Biei from aftermaths of any volcanic eruptions at Mt. Tokachi. There is nothing else to do at the pond apart from taking pictures. Bear in mind toilets are not available in the vicinity as the pond is about 10 minutes walk through the forest from the parking lot. How to reach Blue Pond? Reaching the pond is quite difficult through public transport. You will need to catch the bus to Shirogane Onsen from Biei station and stop at Shirogane Aoiike Iriguchi (白金青い池入口) . It runs only 5 times a day, takes about 20 minutes and costs 540 yen. Click here for directions from Furano station. 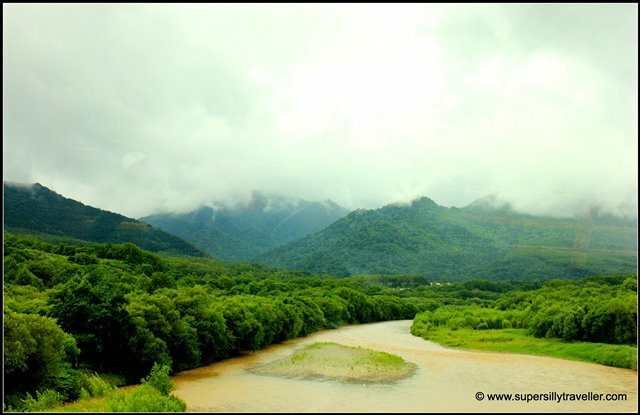 On route 966 connecting Biei with Shirogane Onsen, you will also cross Shirakaba Road selected as one of the best 100 roads in Hokkaido to drive. A craggy region of land between Highways 237 and 452. 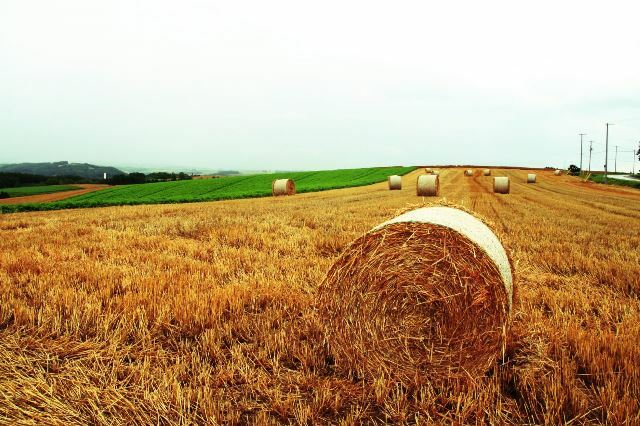 It is full of landscapes where farming land entwine to form colourful fields just like a patchwork blanket. Located on the west side of the Biei station, the Northwest Hill Observatory is a place from where you can view the entire region`s terrain along with Daisetsuzan mountain and flowers fields. It is about 10 minutes’ drive from Biei station. Click here for directions. Another good location for some nice photographs, miss this one if you have been to Patchwork road. There are some good spots for sightseeing such as Shikisai hill a spacious flower park and Takushinkan Photo Gallery by renowned photographer Maeda Shinzo open from 9 am-5 pm from May to October and 10 am-4 pm for rest of the months. Click here for directions to the gallery. Let me know if you have any favourite places in Furano and Biei that I have missed by commenting below. Hello! Thank you so much for sharing your experience. I am planning to visit Japan to see lavender and sunflower fields. Is it possible to do a day trip from Sapporo? Depart Sapporo in the morning, arrive Furano before noon, then leave for Sapporo before night time? Via JR Pass? or should I stay at least one night? Thanks!